The straight arm pullover is a great exercise which works the chest, abs and lats. Equipment needed: dumbbells, flat surface or a bench. Muscles used: pectoralis, latissimus dorsi, rectus abdominus, serratis anterior. Start- start be lying supine (on your back) on a bench. Hold one dumbbell in each arm and with a straight arm, hold the dumbbells up so that your arm is perpendicular to the ceiling. Movement- start by engaging your core and slowly lower one arm back behing your head. Make sure to maintain a straight arm throughout the movement and to keep the opposite arm in place. Lower the arm until it reaches either ear level or you feel discomfort in the shoulder or back. Slowly raise back to your starting position and alternate arms. In the fitness industry today there are plenty of common buzz words that we hear all of the time. Unfortunately, they are used to sell a product or service and the general public will have an incorrect idea of what the word means. Occasionally, I will post about the various common buzzwords and try to give the real meaning compared to what the common thoughts are on those terms. 1. The Core– The Core is probably the most common buzzword in the industry today. Often times the core or core exercises are thought of as exercises that work out the rectus abdominus (the “six pack” muscle) involving some kind of instability or balance. Various products market themselves as being able to target the core and by doing so, the person using it will lose fat in the midsection. the reality– In reality the core consists of several muscles, large and small. All of these muscles act on the midsection in some way or another. The goal of training the core is not to get a six pack, washboard abs or to lose weight around the midsection. The real goal of core training is to enhance posture and stability by making the muscles work together in the correct patterns. Core training is an essential part of any program because those with a strong core can do a lot more than those without. 2. Tone up– Everybody seems to want to tone up and very often, especially women, they want to tone up without building muscle. The way people speak about muscle tone is almost as if the muscles are clay and can be molded into these really defined objects. the reality– When people talk about muscle tone, they are usually referring to muscle definition. Having defined muscles consists of three things. First is that you need to have a decent amount muscle. A very skinny person with little muscle mass will not have much muscle tone or definition because there is nothing to show so you need to build muscle to “tone up.” Second is that you need to have low bodyfat. No matter how big the muscles are or how athletic a person is, if there is a lot of bodyfat, the muscles won’t look as defined. They are still there but not really visible if under layers of fat. The third thing that is needed is actually what muscle tone really is. Muscle tone refers to bodies state of readiness. This means the bodies ability to act quickly. Even at rest, a certain percentage of our muscles are still activating. This muscle activity is the muscle tone. Generally tone is developed through regular activity which is why athletes are usually very defined. Regular exercise will help increase the rate of activity but it’s important to change up the routine and perform athletic movements if possible. Athletes are generally very defined and this is because it’s their job to work out so their bodies are at a very high state of activity. 3. The lower abs– Most people carry a little extra fat around the midsection near or below the navel. Even very fit people tend to have it. This area just seems to be a place that the body likes to store extra fat. Obviously, as a result, people want to lose fat in this area and tons of products are out there claiming to work the lower abs. All of these products calim that by using them, they will assist in losing the fat in that area and developing a defined lower portion of the abdominal area. the reality– Again, this subject like the one above almost needs to be broken into two separate areas. I will go into greater detail next week on training the abdominal area so for now I will focus on the idea of a separate lower abdominal area. The lower abs do not exist as an entity separate from the upper portion. It’s all one muscle and there is no way of targeting one portion over the other. Often times a person may feel pain in near the pelvis and think that they are working the lower abs but in reality they are feeling the pain in their hip flexors. The exercise of the week this week is a great total body exercise. 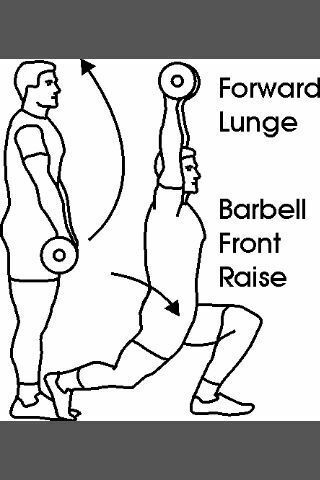 It is an intermediate level exercise so male sure you are comfortable with lunges, have good balance as well as shoulder strength before trying. Start- to begin, stand straight with your feet hip width apart. Hold that bar out in front of you at about shoulder width apart. The arms should be extended with a slight bend at the elbows. Movement (a)– begin by taking a step forward. The step should be a comfortable distance, not too long and not too short, you should still feel balanced. Movement (b)- this part of the movement will require that you do two things at the same time. First bend the back knee and drop down into a lunge. Second, at the same time, swing the bar overhead. Male sure to keep the elbows locked in place. Movement (c)- from this position drive up through your front heel and back into the starting position. At the same time lower your arms back into the starting position. 5. Lat pull down behind the neck– this is an exercise which is dangerous for a couple of reasons. First of all, the behind the neck Lat Pull down is very bad for the shoulders. Pulling behind the neck puts unnecessary stress on the rotator cuff muscles because it well beyond our natural range of motion. Over time, this excessive stress can lead to a major shoulder injury. The second problem is that people often injure themselves while doing this exercise by hitting their occipital bone. This is the bone in the back of the cranium which sticks out. Alternative: an alternative to this is to do a pull down to your chest. It works the lats just as well without stressing the shoulders. 6. Abdominal frame- unlike some of the other things on this lost, the abdominal frame is not something that will injure you, it’s just a useless piece of equipment unless the person using it is very weak. Like many other devices marketed as being able to give it’s user washboard abs, the abdominal frame is used by many. The problem is that it allows you to use your arms as a guide through the movement, which takes much of the strain off of the abdominal area. If the goal is to get a good abdominal workout, this is very inefficient. Alternative: A great alternative to this would be to do regular crunches. While they are harder, you will target the abs directly and not be using them passively as with the abdominal frame. Personal Training Business Blog: 5 ways to make home workouts more interesting. As someone with over 6 years of experience as an in-home personal trainer I have learned that creativity and change are the keys to maintaining a solid level of enthusiasm in my clients. The challenge with in home personal training is that the trainer is very limited in what he or she has available. This means that the trainer needs to think outside of the box in order to keep dynamic and interesting sessions. The following are 5 ideas to keep sessions new and interesting. 1. Eyes closed- A very easy way to make almost any exercise more challenging is to do it with your eyes closed. Try completing a lunge or flys on a ball with your eyes closed. It’s not easy. Closing your eyes forces the body to rely on proprioceptors and it’s a great way add variety to an exercise. 2. Progression- The principle of progression is known by all trainers and it should be applied with exercises. Just about any exercise has countless progressions and regressions. If you do the same exercises week after week with the same client, it can get boring very quickly. A great way around this is to progress the core exercises. Adding rotation, changing hand positioning, working on one leg, these are all ways to progress an exercise. Take push ups for example. You can use a staggered grip, an unstable surface, twist into a side plank as ways to make them different. 3. Intervals- Interval training is a great way to make a workout different. Intervals, especially using the HIIT method, will keep the client moving and working at a pace that they won’t really think about the exercises that they are doing. Even if you don’t change the exercises, varying the intervals will be enough to keep the client from being bored. 4. Boxing- Boxing is an awesome way to add variety to a workout. The fact is that people like to punch things so boxing serves as great stress relief. The basics are easy enough to learn and 5-10 minutes in the beginning or end of a workout work really well. You will need boxing gloves and mitts, and it’s important to learn punching technique as well as how to hold pads. 5. Use household items- Be creative. Almost anything in the apartment can be used for a workout. Stack 2 phonebooks for a step, climb stairs, use a chair for dips or use water bottles as weights. Look around the apartment or house and be creative, clients appreciate that and it places you a step ahead of everyone else. Question: Ryan, I currently weigh 125 lbs. I have pretty much been the same weight my entire adult life but over the past 3 years, my body has changed dramatically. Even though my weight gas stayed the same, my body has changed for the worse. I’m flabbier, my clothes don’t fit and I feel bad. How is this possible and how can I turn my fat into muscle? Answer: Your situation is a very common one and it is not at all strange that your body has changed while the weight stayed the same. I don’t know your age but as we get older, our bodies naturally gain fat. What has probably happened is that over the past few years, you gained bodyfat due to diet and inactivity. You lost lean weight and gained fat weight. Since your total calories probably haven’t changed, your weight stayed the same while your body changed. A good way to look at this phenomenon is to consider this. 5 lbs of fat takes up about 4 times the surface area as 5 lbs of muscle. So if over time, you gain even 5 lbs of fat while losing 5 lbs of muscle, your body will look a lot different while maintaining the weight. To answer the second part of your question, it’s a common misconception that one can turn fat into muscle. Unfortunately, these are two independent processes which tend to work together but need to be approached separately. The first part is losing fat weight and the second part is building lean weight. Losing fat weight takes a combination of three things. First, the diet needs to be healthy and low in fat and sugar. Second, is that you need cardiovascular activity. Third is that you need to build muscle, in order to increase your metabolism and burn more at rest. The second part, building lean weight or muscle, is achieved primarilly through resistence training with weights. Hope this helps and feel free to comment.